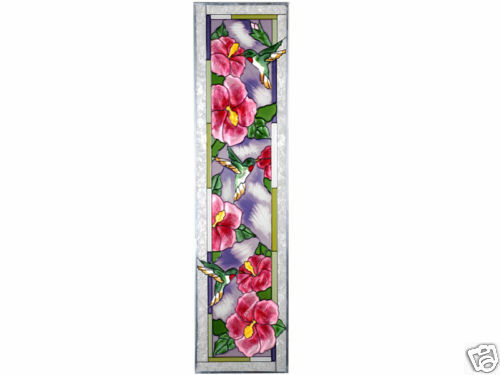 "Hummingbirds Hibiscus Vertical Stained Art Glass Window Suncatcher" Spectacular is the only word to describe the impact this hand-painted stained art glass hummingbird panel has on a room when sunlight illuminates its color and detail! Zinc-framed, this impressive vertical piece measures 10.25" wide x 42" high. It features two soldered metal rings along the top for hanging. FREE Chain Kit Included. Made in the USA by Silver Creek.